Today, we were able to visit Houten, a planned city near Utrecht and speak with André Boterman who works in the City’s planning department. Exploring Houten and hearing more about its history from André made me consider several other planned communities I’ve interacted with. Houten had three centres, the old city, Houten (the phase one centre) and Houten Castellum (the phase two centre). Rather than build around the old city, when the original planned Houten was built, the city decided to build around a new train station. When Houten decided to expand, they forced the NS to build another station to centre the new development around which became Houten Castellum. Houten’s design philosophy is that of human scale design. They intended to build a community that residents, especially children, could move around in without traveling by car. 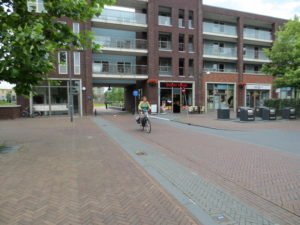 This was achieved by creating a ring road for vehicles with a hierarchy of streets that weave into small neighbourhood compartments without allowing cross city vehicular traffic (I draw a conceptual drawing of Houten in an earlier blog before I learned we would visit.) Each neighbourhood compartment is designed to connect easily with the compartments beside it and the city centre by foot or bike. Cars would need to return to the ring road to visit another compartment. The entirety of each phase of the city should be traversable by bike within 15 minutes. This planned settlement is so successful that the wait for social housing in Houten is 12-13 years and real estate is significantly more expensive than in neighbouring cities. Travelling through the city, the neighbourhoods really did feel safe for bikes to travel through. It was easy to travel large distances quickly by bicycle, because bike users are given right away and can easily find a path. Additionally, it was simply enjoyable to have a comfortable ride through the city. Overall, Houten showcases the Dutch CROW manual’s cohesive, comfortable network principles. 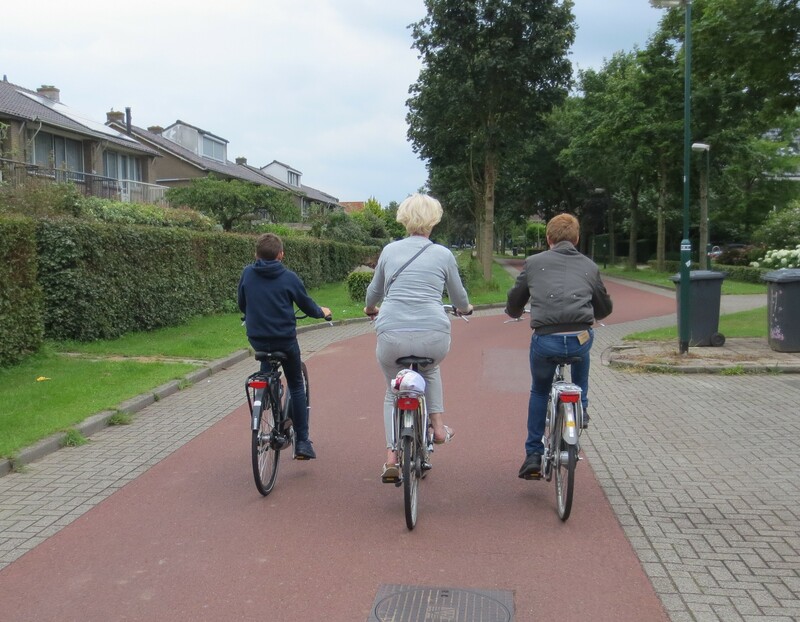 Cycling connections in Houten Castellum, the city centre of phase two’s development. Although there were some comments from our class about the relative calmness and perceived “Pleasantville” aesthetic, as someone who lives in a planned community currently, I had some additional thoughts. First, there were a lot of people out and relaxing, but it is summer break (for only a week) here in the Nederlands so many families were acting like they were on vacation for a reason. Second, simply removing and slowly traffic contributes to this feel as road users feel more comfortable and less stressed. Third, as I’ve seen in my community, aesthetic and planning cohesion hides cultural and class differences. Biking through the area for two hours does not give us enough information about how those in social housing feel about living in the neighbourhood or how residents perceive themselves within the community. We need more information to judge the social success of the neighbourhood. It’s lovely to see Grandma out with the Grandkids. Visiting Houten reminded me of my undergrad course’s study of a small neighbourhood in Victoria. 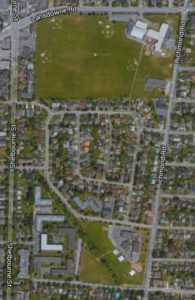 Like Houten, it was surrounded by major streets and had a hierarchy of minor streets that discouraged non-residents from driving through. I believe additional barriers were added later on to further restrict car traffic. There was also an elementary school and high school nearby as well as several churches. Children were supposed to be able to walk to school themselves and play on the road (although the extremely wide roads with no sidewalk ended up encouraging speeding). This neighbourhood was smaller than Houten, but the underlying philosophy of reducing unnecessary thru traffic remains. It was just done without the radical wholesale reimagining of the city done in Houten. 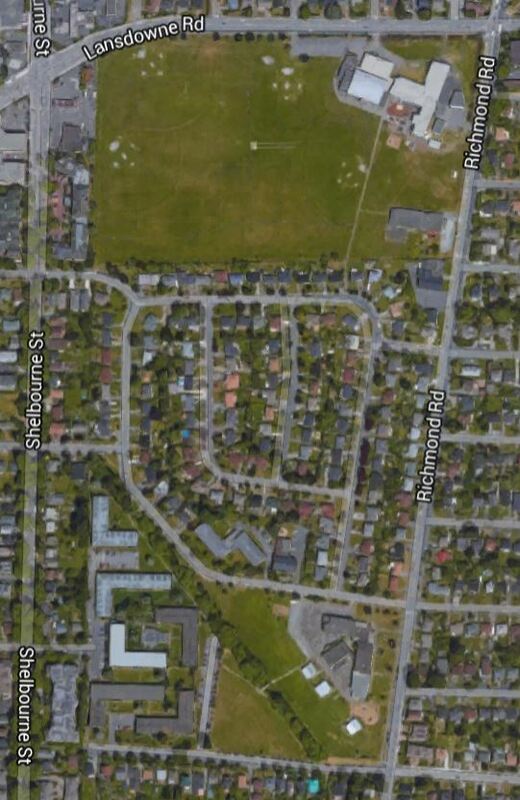 Neighbourhood in Victoria built to reduce unnecessary traffic (Google Maps, 2016). André also mentioned Houten is specifically inviting Syrian refugees to come to the city by building housing for them. I wonder how they will help refugees integrate into the community and use the skills they bring. Will they just become part of the commuters that also leave Houten daily to work elsewhere or will they be able to find work in the city?